Neft, David S., and Cohen, Richard M.
New York: St. Martin's Griffin, 1996. 16th Edition. Trade paperback. Good. No dust jacket as issued. "X' on title page.. 699 pages. This book covers the history of every players and every team from 1901 through 1995, with detailed statistics and summaries of each year from Opening Day thrugh the World Series, along with key historical developments in the game. Condition: Good. No dust jacket as issued. "X' on title page. New York: St. Martin's Press, 1989. 9th edition. Trade paperback. Good. No dust jacket as issued. 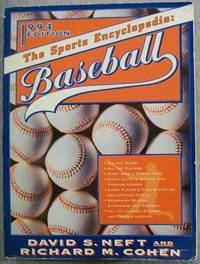 "X" on title page.. 629 p. For organization, accuracy, and sheer readability, there is no reference book that captures the great tradition of baseball like this one. Each year, the authors update and revise the text to include the most up-to-date statistics available on players of today and yesterday. Condition: Good. No dust jacket as issued. "X" on title page. New York: St. Martin's Press, 1994. Light edgewear. Light wear. Very light soiling. 681+ pages. Because of the size & thickness of this book, if you request expedited shipping or shipping outside of the USA, we will need to request additional shipping charges to cover expenses. . Fourteenth Edition. Soft Cover. Very Good. 4to - over 9¾" - 12" tall. New York: St. Martin's Press, 1992. 659pp. Crease on bottom outside corner of front cover.. Twelfth Edition. Soft Cover. G-VG. Thick Quarto. St. Martin's. 1985. Thick 8 1/2" x 11" paperback. VG. Neft, David S. and Cohen, Richard M.
New York: St Martin's Press. Very Good condition,ex-lib. 1988. 8th Edition. ISBN 0-312-02033-0 . St. Martin's Press, New York:1990. Softcover. reading copy. This is the all-time argument settler. Every piece of action on the field since 1901. Readable statistics, plus stories of every season. Comprehensive section on all-time leaders. Numbers for every man on every team - year by year, team by team. ISBN: 0312039387.